Don't miss getting your free limited-edition Banana Bar Crawl coin! 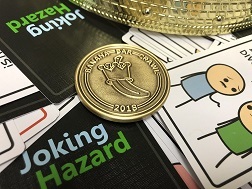 The Banana Bar Crawl is coming, and for the first time we're giving everyone who attends a Limited Edition Banana Bar Crawl Coin to commemorate our legendary yearly banana shenanigans. We're only make one printing of these, and the only way to get yours is to make it out the Banana Bar Crawl May 5th in Dallas. Event details will be posted as they're finalized here.